As the earth rolled beneath his feet and buildings crumbled, the Mexico City Secretary of Health, Dr. Armando Ahued, knew that he and his colleagues did not have the expertise to deal with the short and long-term consequences of the mental trauma that would follow the earthquakes. 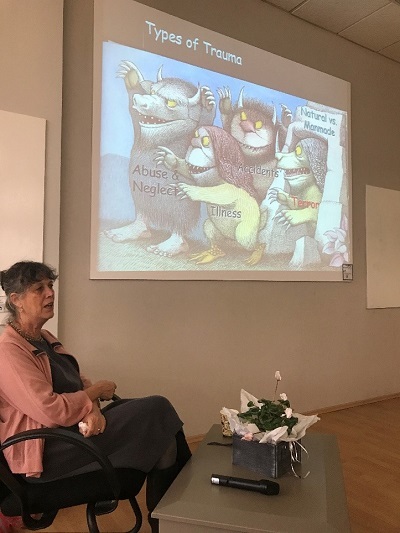 The offer of help from Hadassah’s Prof. Esti Galili-Weisstub, an international expert on dealing with Post Traumatic Stress Syndrome after a disaster, was extremely welcome. 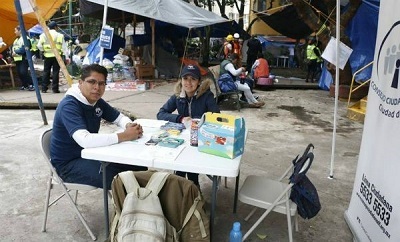 Facilitated by Hadassah International and the Hadassah Medical Center, and funded by the Mexican Jewish community, Prof. Galili arrived in Mexico City two weeks after the earthquakes, and was warmly welcomed by many segments of the Mexican community who are trying to respond to the disaster. In a very short time, the government of Mexico City and several other institutions made all their resources available to maximize the impact of Prof. Galili’s time in Mexico. 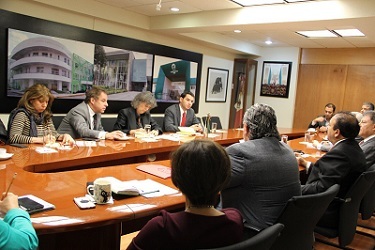 Prof. Esti Galili’s first meeting was with Government officials, including Mexico City Secretary of Health, Dr. Armando Ahued, at the Mexico City Health Ministry to discuss providing immediate support for traumatized victims. The head of every department in the Health Ministry attended the meeting and Prof. Galili worked with them to draw up a series of plans of action that they could implement to mitigate both the short and long-term consequences of the disaster. The attendees at this meeting with Prof. Galili included Armando Ahued (center with mustache), Román Rosales, Francisco Osuna, Placido E. León, Marisol Villegas, Alejandro Córdova, Fernando Román, Carlos Guerrero, Ana Moreno, and José Luis Osorio from the Health Ministry; Israel Vice-Ambassador Alon Lavi; Hadassah Mexico Board Member Carlos Glatt; and Ethel Fainstein, Director of Hadassah Mexico and Latin America. Later in the day Prof. Esti Galili met with members of Cadena, an organization of first responders from the Jewish community who had been rescuing earthquake victims. 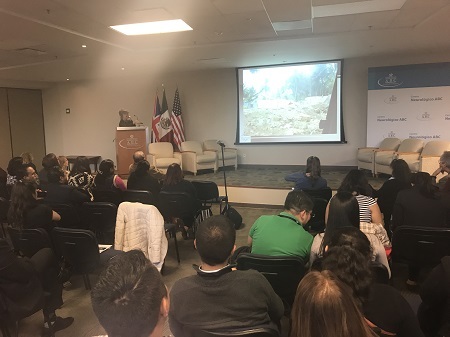 Several of the participants shown in this photo subsequently traveled to Puerto Rico to lend their assistance in dealing with the disaster after Hurricane Maria. They carried with them many of Prof. Galili’s insights on the stress experienced after a dramatic trauma. Having discussed plans with the heads of the various departments within the Ministry of Health, the staff now had to be trained to deal with the crisis. 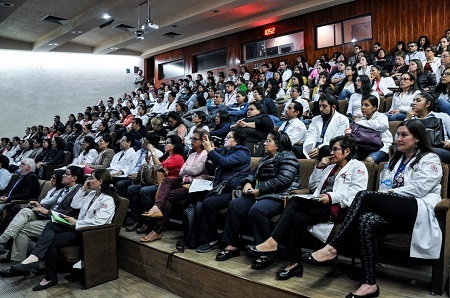 Prof Galili ran a four- hour workshop for all the top officials at the Ministry of Health of Mexico City who are responsible for working in all the different neighborhoods, hospitals, and clinics in the city, and who supervise the care for the hundreds of children and families affected by the earthquake. 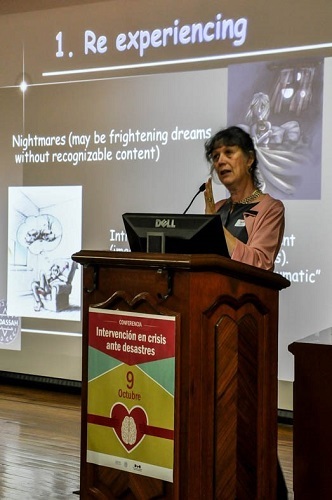 Attendees included psychologists, psychiatrists, mental health workers, home care workers, and those who deal with communications, health promotion, gender violence, and long-distance medicine. The backdrop on the stage says, “Earthquake 2017: Workshop on Crisis Intervention and Post Traumatic Stress”. Under the header you can see in big letters “CDMX-Israel” and the Hadassah International logo at the upper corner of the stage background. Children are often profoundly affected by a traumatic crisis. 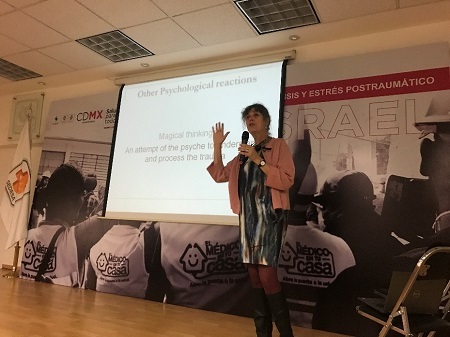 Prof. Galili ran a workshop for a packed audience at the Children’s Hospital of Mexico, providing training on how to deal with Crisis Intervention and detecting emotional signs of Post Traumatic Syndrome. 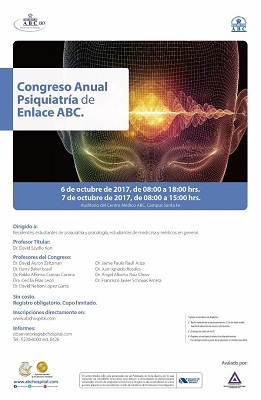 Prof. Esti Galili was invited to make a presentation to the National Institute of Psychiatry at the National Psychiatric Hospital, the most prestigious mental health institution in Mexico. The Director of the Hospital, Dr. Maria Elena Medina Mora is one of the most important mental health professionals in Mexico and was nominated by the Secretary of Health of the Mexican Republic to be the person responsible for planning new policies on mental health. Over one hundred mental health specialists and coordinators made a point of coming to hear and learn about “Crisis intervention in disaster situations”. During the meeting, there were discussions on strategic planning for new health protocols with Dr. Medina Mora, who had been assigned by the Minister of Health to develop new plans to respond to this crisis. School children were in class when the earthquake struck Mexico City on September 19th. Buildings collapsed. Children were killed. Both students and staff were profoundly traumatized. Prof. Est Galili went to the Michel Faraday School in the Miguel Hidalgo School District in Mexico City, which is one of the areas most impacted by the earthquake, and met with 200 teachers and caregivers from 19 Kindergardens and Child Development Centers that are attended by 1088 children between the ages of two and six years old. Meeting the leadership of the Jewish Community. 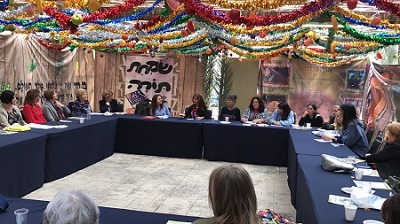 A colorful Sukkah was the setting for Prof. Esti Galili to meet with the presidents of the Jewish Federation and Keren Hayesod Women’s Divisions. Mrs. Marta Flisser, a past president of the Women division of Keren Hayesod, had served as the translator at the school on Monday. 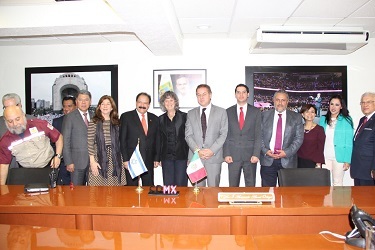 She thanked Prof. Galili for being an ambassador of Israel and acknowledged the profound impact Prof. Galili’s visit had made on Mexico’s ability to handle the trauma following the earthquakes. 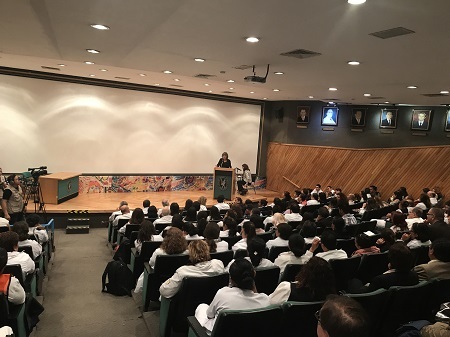 Ethel Fainstein, Director of Hadassah Mexico thanked Mrs. Flisser, stating that the mission of Hadassah International is to be an ambassador, promoting health and peace. The final stop on Prof. Galili’s whirlwind tour was a lunch with the director of the staff of 100 psychologists in the NGO. The Ciudadanois offers free legal and psychological assistance services to anyone who requires it. They work in the areas where there are damaged and collapsed buildings. Hadassah will train the staff in the future. For many years Mexico had supported the life-saving work of Hadassah. 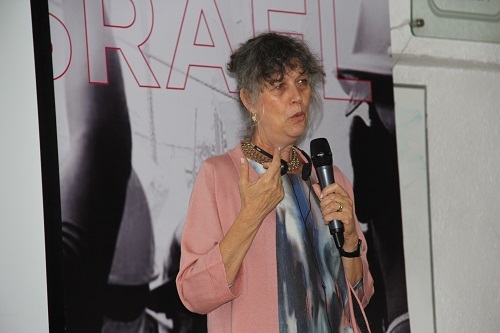 Prof. Esti Galili-Weisstub’ s humanitarian mission to Mexico was an opportunity for Hadassah to help to save the soul of Mexico. Prof. Esti Galili-Weisstub is interviewed by the media.